Silver Birch, a 33-1 shot, held on down the finishing straight to become the sixth Irish-trained winner of the Grand National in the last nine years. Robbie Power's mount overtook Slim Pickings over the final fence and then resisted a late charge from McKelvey to win by three-quarters of a length. Long-time leader Slim Pickings was third, with Philson Run fourth. None of the favourites featured, with Point Barrow not even making it past the first fence at Aintree. Silver Birch, trained by Gordon Elliott, jumped superbly and jockey Power was understandably delighted. "It is an unreal feeling, a dream come true," he said. "You won't see better than this. Fair play to trainer Gordon Elliott, he has done some job to get this horse ready. "The last furlong was the longest I have ever ridden! "I thought I might have gone a bit too soon but he was an easy ride. Every time he saw a big fence he just pricked his ears back and took it on." Elliott is in his first year as a trainer and admitted "this means a lot". "We are a young chain, I haven't had my licence for 12 months yet, so hopefully we can get going a bit. We are going to enjoy tonight," he added. "It was a brilliant race. Silver Birch has been improving all the time and jumped like a buck." The race took an age to get under way, with a false start and numerous re-sets before they were finally off and running. Cloudy Bays, who eventually pulled up at The Chair, missed the start by a good dozen lengths but the rest were away as a group. The grey The Outlier settled into the early lead but by the Canal Turn rank outsider Naunton Brook had hit the front with Ballycassidy in second and Bewleys Berry in third. They continued to lead the way over Valentines and remained at the head of the field for the rest of the first circuit. As the race moved past two-thirds distance Slim Pickings, Liberthine and Simon all came into contention and by the third last there were eight horses in with a shout. Slim Pickings led the pack over the penultimate fence, with Silver Birch a couple of lengths back, and approaching the last they pulled clear of the rest. Both horses were travelling well but Silver Birch met the last better than his rival and landed in the lead. As they approached The Elbow, Power's mount pulled a couple of lengths clear, with the fast-finishing McKelvey starting to get into contention. Silver Birch began to run out of steam but had enough strength to hold on for victory, with McKelvey taking Slim Pickings for second with the post in sight. Monkerhostin was the racecourse gamble and was backed down to 8-1 from 25-1 on the day but refused at the Foinavon Fence first time round. 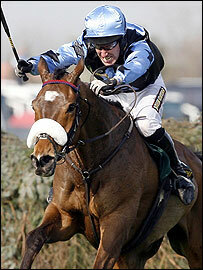 He went off co-favourite with Point Barrow, who was the first to fall, and Joes Edge, who pulled up at the 20th.